Would you like to give someone special a "Dinner & Show" as a Gift...but are unsure of their taste or schedule? 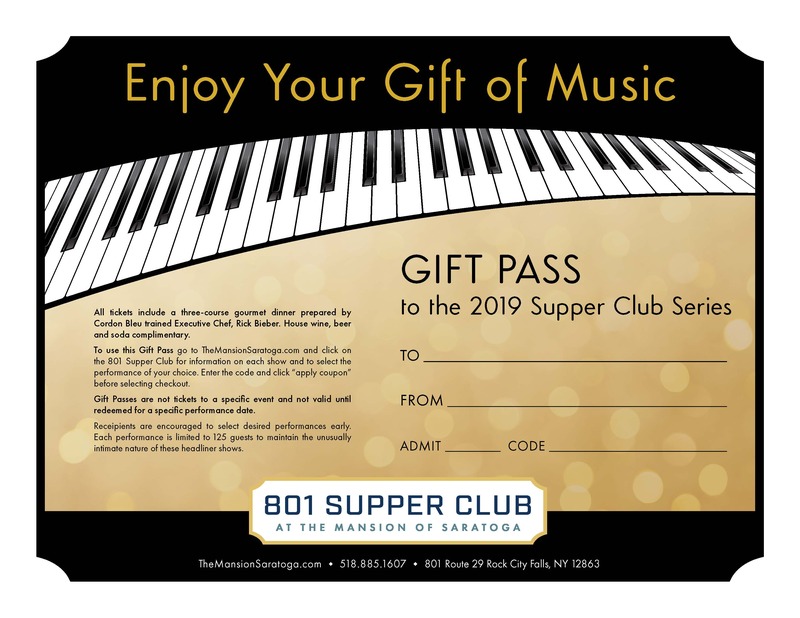 A Gift Pass to the 801 SUPPER CLUB is the perfect solution! The Gift Pass is redeemable for any of our 2019 performances. This allows your reciepient to pick a show they would enjoy and a date that works into their schedule! A perfect for: The Holidays, Birthday Gifts, Mother's Day, Father's Day or just as a Thank You for a Special Friend. 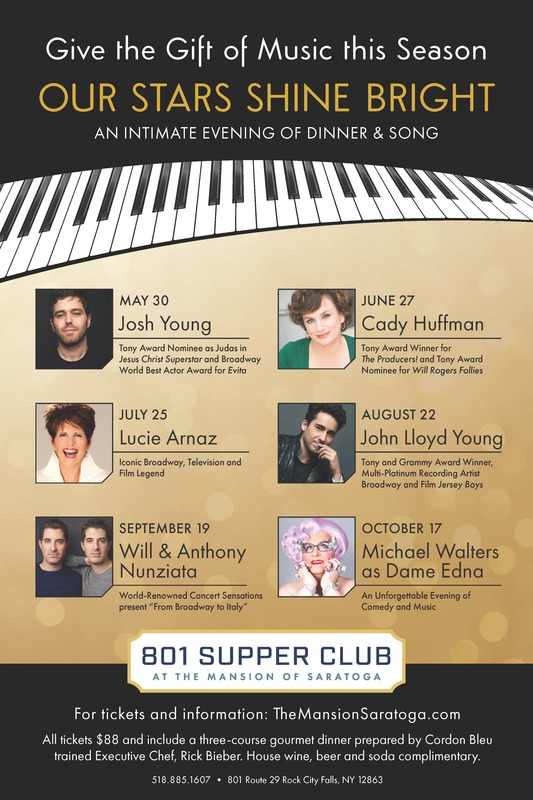 Each Gift Pass you purchase is valid for the number of Supper Club tickets selected. Example: If you select 2, your Gift Pass is valid for 2 people to attend one selected performance or or one person to attend two selected performances. To purchase passes for separate receipients, you must complete separate transactions. Once purchased, the Gift Pass will be sent to YOU via email. The Gift Pass can be printed and enclosed in a card and/or forwarded via email to your recipient. Gift Passes are not tickets to a specific event and not valid until redeemed for a specific performance date. Receipients are encouraged to select desired performances early. Each performance is limited to 125 guests to maintain the unusually intimate nature of these headliner shows. Shows typically sell out within 30 days of performance. Please allow up to 7 days for Gift Passes to be activated. These unique and special evenings begin with dinner and cocktails at 6pm at the Historic Mansion Inn located at 801 Rt 29 in the Saratoga hamlet of Rock City Falls. The location is 6 miles west of downtown Saratoga Springs. We encourage your guests to attend early and visit the gardens and public rooms of the 1866 National Historic Register Home of Industrialist and Congressmen George West. A leisurely gourmet quality dinner is served beginning at 6pm on the Mansion's Victorian Deck overlooking the gardens. Seating is assigned and should your guest wish to be specifically seated with other individuals we work to accomodate the request. Carriage House Theatre Doors open at 7:30pm and is open seating. With only 125 guests, the last row of the house is only 60 feet from the stage. There is not a bad seat in the house. Performances beign at 8pm and usually run 1.5 hours without an intermission. The layback atmosphere of the Mansion make it usual for these famous performers to come out after curtain, call grab a drink and meet and chat with members of the audience and as time permits take pictures with them. It is indeed a special night your guest will not soon forget.